Click here to reserve your copy of Leprechaun's Castle today! In Leprechaun's Castle, the players are noble family members in Ireland. These Lords and Ladies will score points by being the first to reach castles that contain Leprechauns before their close competitors. They will build and travel on roads between castles to begin a special exploration in search of collecting gold coins, pots of gold, and shamrocks. By carefully choosing from the available actions, players will draw road tiles and attempt to explore castles without getting caught by an evil leprechaun. Players will use their special abilities and plan their turns to locate the most shamrocks. These brave souls may escape the clutches of the evil leprechaun but not even the luck of the Irish can save them from a Banshee! The game system allows players to choose from the available six actions but may not take more than four. The available actions are: place a road, travel to a castle, exchange 1 road, destroy 1 road, draw an exploration card, or spend a pot of gold. You are penguins with superior intelligence in Antarctica and are fed up with fighting Fishermen, Leopard Seals, and Orcas for your daily meals. It is time you stop being afraid of your natural predators, now it's their turn to be afraid! You have devised the ultimate plan to construct a pyramid that will call the aliens down from the heavens to help you. Collect resources to build pyramid bricks so the aliens will grant you their technology. Build enough bricks and the aliens will begin to arrive and protect your precious fishing grounds! 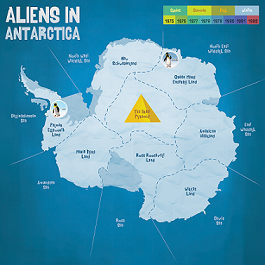 In Aliens in Antarctica, players will score points by collecting alien technology, upgrading their penguin, and collecting fish eyeballs. You must move to the proper locations on the board and take the desired action in order to collect the resources you need. You will only be successful if you do this without being eaten by a natural predator or being beat to the available supplies! Copyright © 2009-2011 True To Life Games. All Rights Reserved.